In February 2010 I was commissioned by Claire Bisignano Chesnoff owner of Claire Properties to paint a mural for her new office space. Claire is an experienced and highly professional Realtor in Staten Island with a reputation above the rest. She is knowledgeable in all aspects of the business, and is admired and respected by her peers. 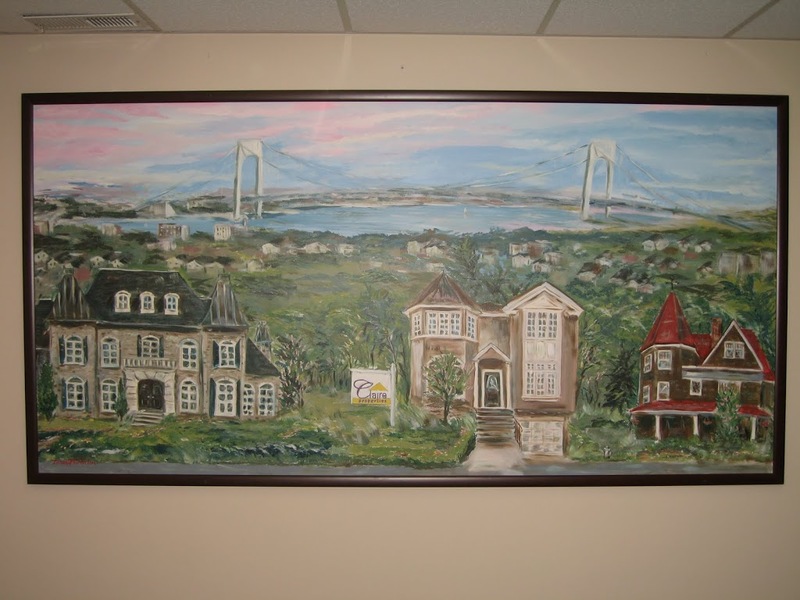 Therefore, the painting I was about to design and create had to represent both the owner of Claire Properties and the business of real estate on Staten Island. I have chosen the iconic view of the Verrazano Bridge to span the painting, and to represent Claire’s broad skills and experience. The different types of homes represent the variety of architecture typical to our various neighborhoods. They are whimsically embellished with charming details like swing on the porch, family pet, and newspaper on the stoop or even a colorful hydrant. I have worked on this project with Pat Flanagan of Elegant Options Interiors, therefore the color scheme was thoughtfully coordinated to match and emphasize the bold interior palette. The mural was also custom framed to create an illusion of a large window and to match the interior furnishings. As a final touch, the actual door to Claire’s personal office was faux painted with panels, to imitate a classic, almost reminiscent of a magic door to a fairytale as if from the pages of “Alice in Wonderland”. Any visitor is sure to admire this unique space in anticipation of purchasing their dream home. FAUX And Decorative Painting Make For Magical Murals Real Art For All! Wall Murals For NYC Businesses And Homes!